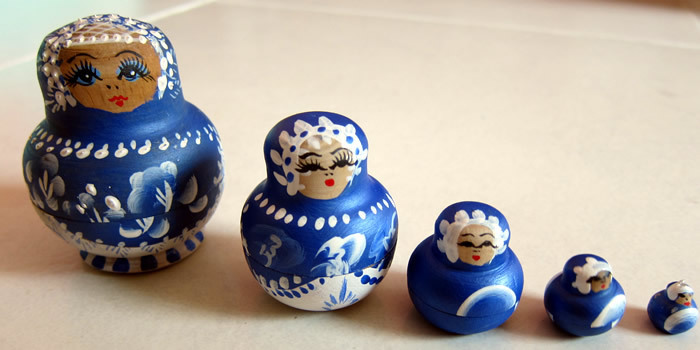 Her grandparents went on holiday to the cold Harbin, China and bought a few Russian dolls as cultural souvenirs. They make good sensory activities for children and Dot loves to play with them as she finds it fascinating to see a doll with many dolls within. She called them, “Baby”. It is a fun activity for her to discover about different sizes, train her motor skills when she try to fit the head and the bottom together, logical thinking and most importantly she loves playing with them. I will be there guiding her on how to put the small doll inside a bigger doll. She will then learn to follow my instructions. Sometimes I will just let her discover her own mistakes and then she tries again and again. When she manages to keep all the dolls as one, her face beams with pride and joy. Sometimes she will pretend play with the dolls. It just puts a smile on my face when I see her child-like joy. Previous post[Video] Consuming Kids: The Commercialization of Childhood Next postWhat a Big Draw for us!